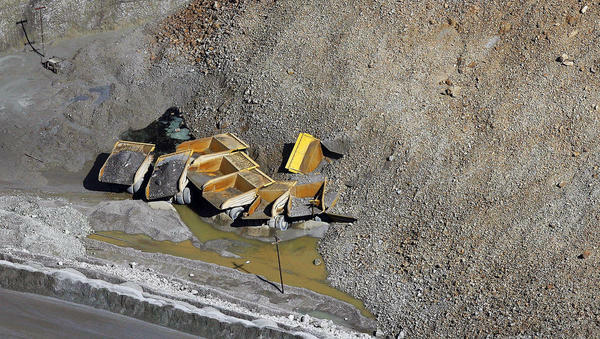 Further news is emerging about the landslide at Bingham Canyon copper mine last week. 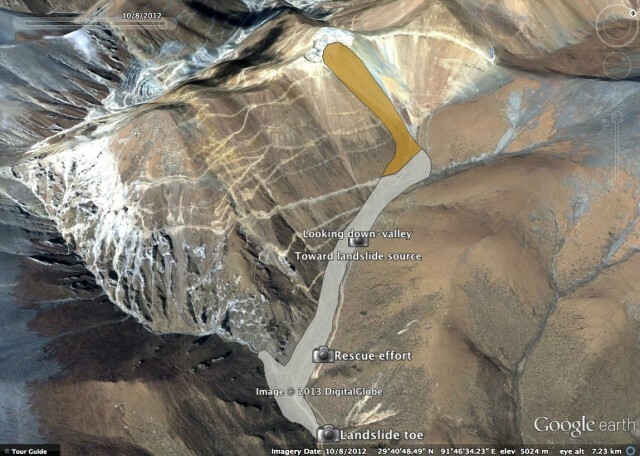 The transparency of all involved is impressive to behold, and is a remarkable contrast to the much more costly in human terms landslide at the Jiama mine in Tibet. I thoroughly recommend that you visit the Kennecott Utah Copper flickr site, which has some wonderful images of the landslide. I cannot post them here, but do take a look. The size of the slide was significant,” the company said in an emailed statement. “We don’t have information yet regarding the magnitude or impact. We do know that the flow into the pit extended beyond the scenarios we forecasted, having a greater impact on equipment. I suspect that we need to undertake more research on the ways that we can extract this sort of information from these datasets – my colleagues and I have also been working on this. It would be fascinating to back analyse the dataset from this event to see if we can develop better techniques. I suspect that if we transfer the techniques we have been developing in New Zealand and Italy to this setting and data type we might be able do this better. Meanwhile, the implications of this event are becoming apparent. Locally the mine is continuing to produce copper through stockpiled resources (they are reported to have 20 days worth of resources), but the Wall Street Journal is reporting that the mine is asking its workers to take leave. As the images below show, the landslide has caused the loss of a large part of the wall of the pit, filled the mine floor, destroyed buildings and the haul road, and buried equipment. Mining cannot be restarted until the haul road is rebuilt (in itself this is not trivial), and the above article suggests that it will take months rather than weeks to restart production. A key issue will be the stability of the material left on the slipped slope – if further movement occurs then restarting mining will be difficult until it has been stabilized. Earth’s Largest Excavation site has major landside this week. Commonwealth Bank said Monday that assuming the Bingham Canyon mine isn’t operational for the rest of the year, the mine likely would report a loss of US$79 million. The bank had previously expected the mine to earn US$701 million this year, about 6% of Rio Tinto’s total earnings. My interpretation of this is a loss of $770 million, slightly lower but still a huge sum of money. There are also some concerns that the event might cause an increase in global copper prices, but so far this does not seem to have occurred. I am sure that more information will emerge in the next few days – I will post again if this is the case. Adrian Moon, who regularly contributes this blog, has written an analysis of the landslide. This is a very impressive piece of work. He has given me permission to make it available, so I have uploaded it onto Slideshare and have embedded it below. You should be able to read it below. Adrian also asked me to acknowledge the input of his colleagues Robert Barnett, Professor of Contemporary Tibetan Studies, Columbia University and Yeshi Dorje at the Voice of America Tibetan Service. It is notable that in all three cases the idea that this was an entirely natural “act of god” is challenged. I concur with this. 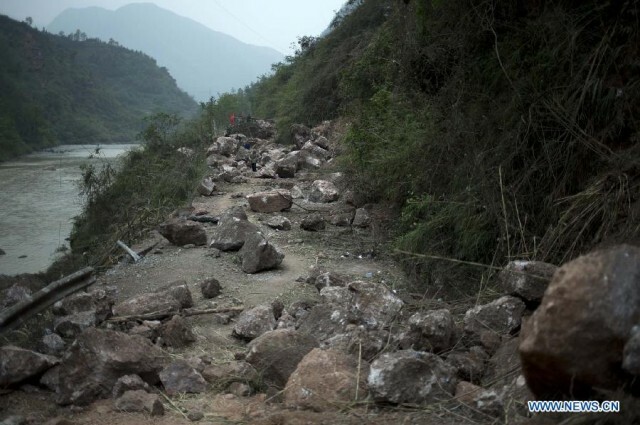 A number of Chinese media outlets have articles about the threats posed by landslides in the aftermath of the 20th May 2013 Lushan earthquake in Sichuan Province. It is clear from the imagery (such as the image below) that landslides have represented a very significant component of the costs of this earthquake, although at present it is not clear just how many of the deaths were caused by mass movements. The next major threat is the upcoming rainy season – just weeks away – which will inevitably cause a combination of further first time failures and debris flows of released materials. Ya’an, the County in which Lushan sits, is nicknamed “the city of rain”. In terms of costs, Xinhua are reporting 196 fatalities, 21 people missing and 13,484 injured. The level of damage is very high – 86,300 buildings have collapsed in the quake and about 430,000 houses have been seriously damaged. Eastday China reports that a team of 400 geohazards specialists are working to identify hazards, and are developing warning and evacuation plans. Emphasis is rightly being placed on the emergency camps, which are often extremely vulnerable. 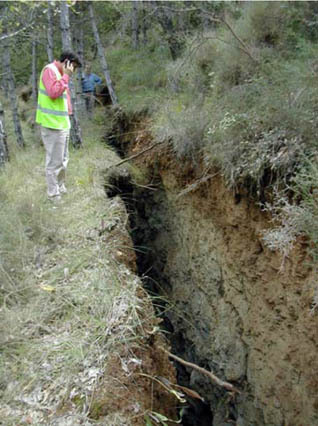 Meanwhile CRI English has an interesting report about landslides that have been deposited into river channels. Whilst these are not valley blocking at present, the loss of flow capacity may allow a lake to develop during the high flow period. Clearly this is unacceptably dangerous. The army are undertaking controlled blasting to clear the blockage. There hasn’t been a repeat of the Vajont disaster in the intervening 50 years, mostly through prudent management of the hazard and perhaps a sprinkling of good fortune. My sense is that we are pushing our luck to the limit with the planned dams in and around the Himalayan Arc. The question as to whether these dams should be built at all is important but beyond the scope of this blog. We are thankful for all of the engineers and plumbers who have been hard at work to establish these plans. However, the potential landslide problems in these areas are acute and will require a much higher level of management than appears to be occurring at present. In the last few days I have posted a couple of times about a landslide on the banks of the reservoir from the Laxiwa Dam in China. It hs been brought to my attention that there is another interesting, but this time in Europe, at Yesa in Spain. The dam, which is located at 42.615N, 1.183E, has an interesting history. A concrete dam was constructed some years ago, with impoundment being undertaken in 1959. However, in recent years a new, much larger, dam has been proposed for the site. 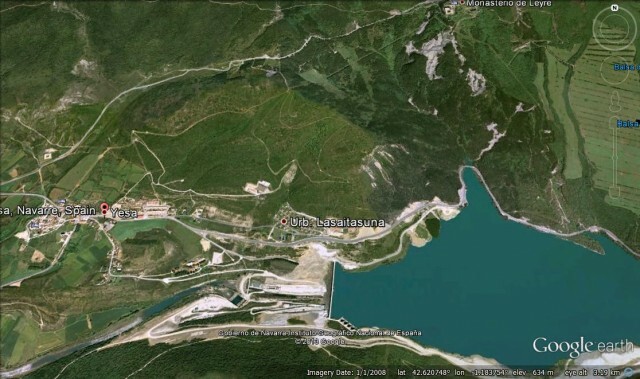 There is a description of the proposed project (NB PDF) – the structure is a 117 m high, concrete-faced gravel dam – but this has not yet been built. It is probably fair to say that the project has not met universal approval, and there are organizations that are actively campaigning against this development. 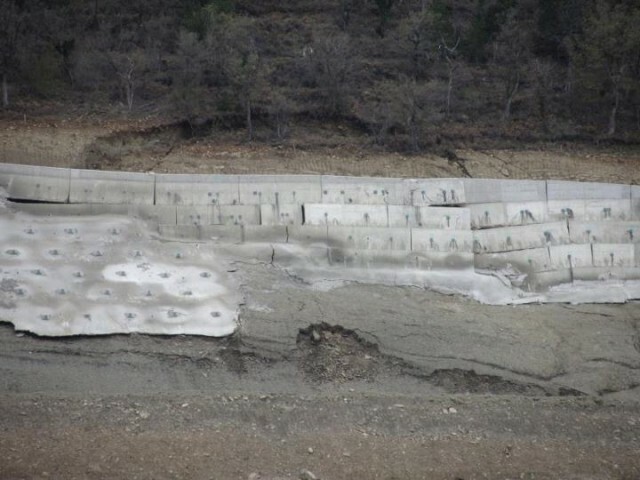 One of the major concerns appears to be the presence of a landslide on the flank of the dam site. This concern was noticed while they were painting the dam. One of these organizations has a website about the landslide (in Spanish) – Google translate does a good job of rendering it comprehensible for those without Spanish language skills. Note that the website is clearly presented from a particular viewpoint and I cannot verify the content. In July 2007 sliding continued to develop and works were suspended whilst a new investigation was undertaken. Further movement occurred in April 2008. In February 2013 the situation deteriorated during heavy rainfall, and considerable additional movement occurred, such that the authorities announced works to stabilise this flank of the abutment. The Yesano website notes that 60 houses on the landslide were evacuated. They won’t know until next month when they can return to their homes. The authorities report that movement rates are currently low (about 1.5 mm pr month), but a large landslide on the flanks of a concrete gravity dam must be a source of real concern.